It has only been my second draft in the Khan’s of Tarkhir draft, but I learned how valuable blue was since that time. In this block, I have noticed a huge number of blue bounce removal and was quick to keep an eye open for them should I decide to go into blue. This moment lasted momentarily as I noticed quite the bomb in Sage-Eye Avengers. I was pretty content with the pick because it put me into a color I wanted to try out. The next few picks were Reality Shift, Channel Harm, and a few Whisk Away(s). Channel Harm was the tough choice for me because it meant taking it over a Whisk Away I was sure to play (and unsure would wheel). I doubt this luck would have happened had we played at the local shop instead of our homebrew draft, but it worked out in my favor. I still am on the fence with Channel Harm. It feels like it has the potential to be a huge blowout, but I have yet to see it work that way. 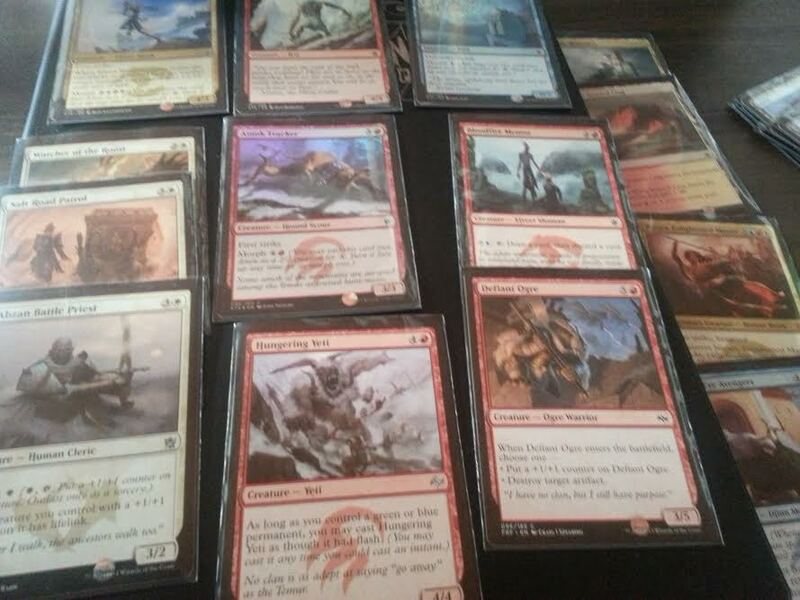 Will of the Naga was a card I heard many people say had potential to be one of the top commons in Fate Reforged. I took this as a license to try it out. I had some sweet spells, but was lacking in the creature department and was given a bone in the form of Narset, Enlightened Master. 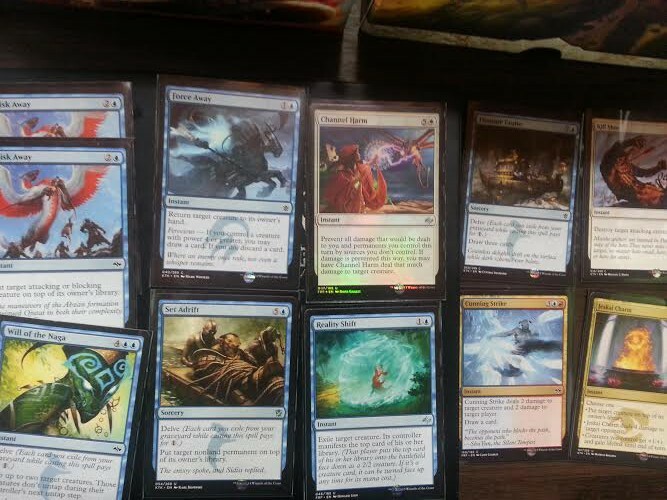 Having a mythic in limited is quite exciting, especially when it’s in your colors. Round one, I edged out against what felt like a selesnya deck. My opponent had at one point a 7/7 Seeker of the Way boosted by a Standsteppe Mastodon. Nothing really bothered me as I always had a way to counteract my opponent’s moves and stall him while I would stabilize with Narset, Abzan Battle Priest, or Efreet Weaponmaster. The legendary creature, I misread, allows you to cast all noncreature spells which cinched my win at the end. Round two my opponent got mana screwed both times. It really sucked because it seemed like he drafted a really good deck. Round three, I played against a quite strong deck. He had a Mastery of the Unseen and I’ve seen how that one card would wreck other players. He had an esper control deck with powerhouses like Noxious Dragon. He never seemed to draw his enchantment in our matches, which worked well for me. At one point, I was down to four life and stabilized once Abzan Battle Priest healed me up. My low drops were blockers that held his bigger threats on board while I was able to bounce and remove other creatures to push damage through. All in all, it seemed to be a decent deck I had. There were a few holes I noticed, mainly how it would have folded easily to an aggressive deck. There simply weren’t enough creatures and removal spell would only delay creatures that took bigger investments to bring out. However, going blue was incredibly fun and it felt nice returning permanents to the top of my owner’s deck multiple times. Yea, yea, I know… a special place in Phyrexia awaits me. Notable Mentions: Treasure Cruise was quite an MVP. Often my yard would be filled with spells and being able to draw 3 while having lots of mana open swung a few games in my favor. Will of the Naga was worth the hype. I think three delve cards would be the most I could afford in a deck like this even with all the spells being cast. Luckily, Bloodfire Mentor helped me due this consistently.